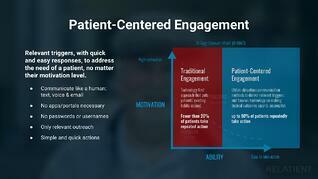 Traditional patient engagement has not lived up to its promise. Only 34% of patients today use a portal, and less than 5% log in twice. Meaningful Use told doctors they need to use a portal, but it seems like nobody told patients. Watch the replay of our webinar. 2017 © Copyright RELATIENT. All Rights Reserved.